I’ve been lazy and didn’t take pictures of my outgoing letters lately, but I’m starting it again now. These letters are for my pals in Japan, Germany and Greece. Last time it took more than a month for my letter to arrive in Greece. I thought it went missing. Hopefully it will be delivered sooner this time! Flower stamps are always one of my favorites. :) What’s your favorite? I must admit that I'm addicted to collecting stamps (to use), and these flower ones are older ones, I think. I usually buy older stamps that you can no longer buy at the post office at a stamp shop or stamp museum. :) Postcard pal is a nice idea, by the way. Thanks! :) I used to buy newly issued stamps, but lately I'm getting into older stamps. I think I like older stamps the better. :) Btw, I love Indian stamps. 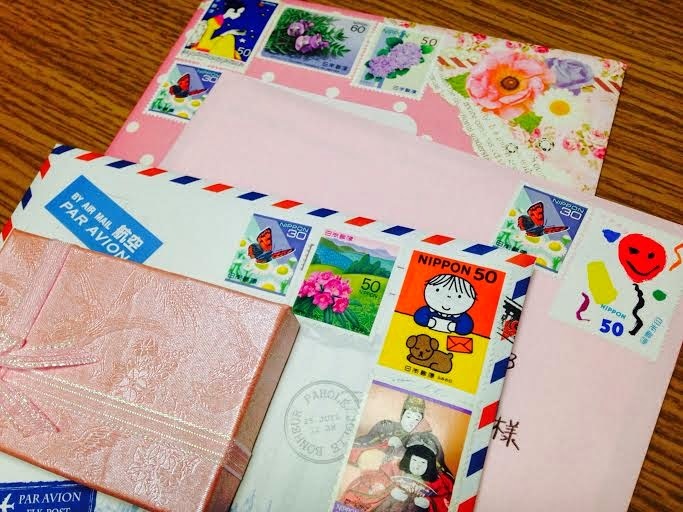 I love looking at your blog pictures of stamps. They are beautiful!! !